CALPUFF is an advanced, integrated Gaussian puff modeling system for the simulation of air pollution dispersion. The model has been adopted by the U.S. Environmental Protection Agency (U.S. EPA) in its Guideline on Air Quality Models as a preferred model for assessing long range transport of air pollutants and their impacts on national parks, wilderness areas and other Federal lands (known as Federal Class I areas) as well as on a case-by-case basis for certain near-field applications involving complex meteorological conditions. CALPUFF is an integrated modeling system consisting of three main modules and a set of pre-processing and post-processing programs. The main components of the modeling system are CALMET (a diagnostic 3-dimensional meteorological model), CALPUFF (an air pollution dispersion model), and CALPOST (a post-processing module). Each of these modules has a graphical user interface (GUI). In addition to these modules, numerous other processors may be used to prepare geophysical (land use and terrain) data in many standard formats, meteorological data (surface, upper air and precipitation data), and interfaces to other models such as the Pennsylvania State University/NCAR Mesoscale Model (MM5), and the Regional Atmospheric Modeling System (RAMS) meteorological model. The CALPUFF model is a non-steady-state Gaussian puff dispersion model designed to simulate the dispersion of buoyant, puff or continuous point and area pollution sources as well as the dispersion of buoyant, continuous line sources. The model also includes algorithms for handling the effect of downwash by nearby buildings in the path of the pollution plumes. CALPUFF can be applied for long-range transport and for complex terrain. The CALPUFF model was originally developed by the Sigma Research Corporation (SRC) in the late 1980s under contract with the California Air Resources Board (CARB) and it was first issued in about 1990. 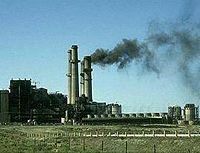 The Sigma Research Corporation subsequently became part of Earth Tech, Inc. After the US EPA designated CALPUFF as a preferred model in their Guideline on Air Quality Models, Earth Tech served as the designated distributor of the model. In April 2006, ownership of the model switched from Earth Tech to the TRC Environmental Corporation, who are currently (August 2006) responsible for maintaining and distributing the model. Beychok, Milton R. (2005). Fundamentals of Stack Gas Dispersion, 4th Edition. author-published. ISBN 0-9644588-0-2. This page was last modified 11:27, 12 September 2013.